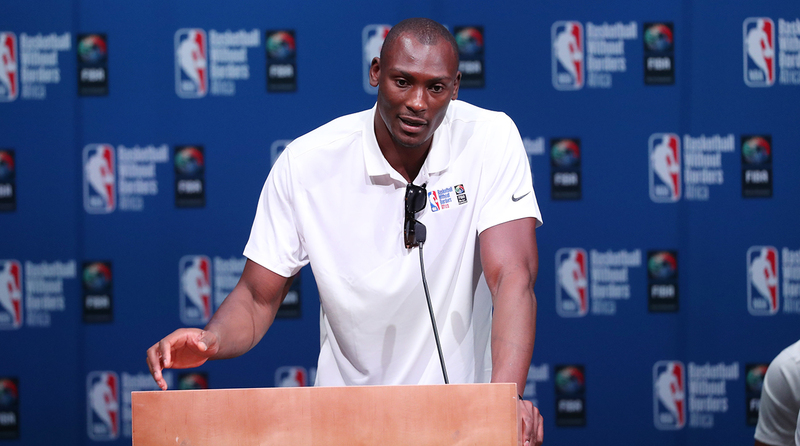 Charlotte Hornets center Bismack Biyombo has invested his wealth to build a better future in the Democratic Republic of the Congo. From creating scholarships for kids to attend high school in the U.S., to refurbishing hospitals, all the way to opening his first high school this summer, the Congolese native is determined to change the biggest misconceptions about his homeland. Bismack Biyombo remembers the best night of sleep of his entire life. The current Hornets center was 19 years old when he visited his home in the Democratic Republic of Congo after his rookie season in the NBA. A couple weeks before making the trip, he decided to put together a basketball camp, enlisting the help of his brothers to gather kids while acquiring shoes and basketballs from a Charlotte equipment manager. Inspired by the restful shut-eye—and the kids’ happiness—Biyombo soon decided to make his basketball camp a more formal affair. It’s grown from one camp and 25 kids to hosting over 1,000 kids in three different cities in the DRC, with Jordan Brand helping to provide new shoes and gear for each participant. How important was that fateful night of sleep? 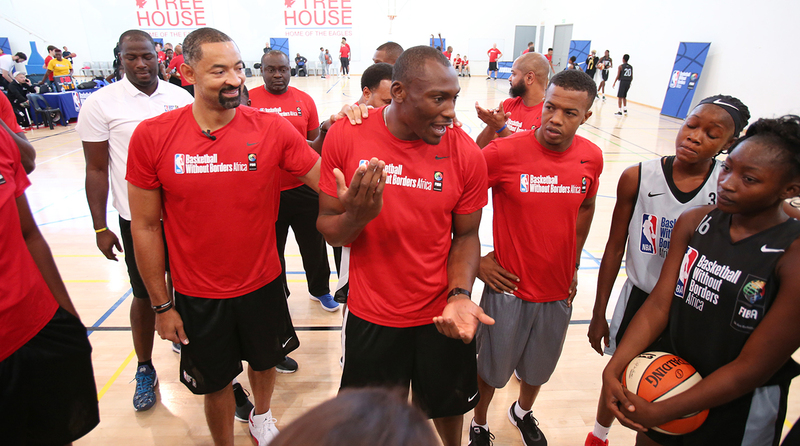 It’s since inspired Biyombo to invest heavily in the youth of his home country—from scholarships for kids to attend high school in the U.S., to refurbishing hospitals, all the way to opening his first high school this summer. The Kivu International School, co-founded and funded by Biyombo, will have 500 students this year, and it also features the first indoor basketball stadium in the entire country. In his chat with The Crossover, Biyombo discussed his humanitarian work, his motivation for helping the next generation, and more. Rohan Nadkarni: What are some of the biggest issues facing kids in the Congo today? Bismack Biyombo: One of the major things is the population is very poor. The country is not poor, the country is worth over $24 trillion, but the population is just poor. Kids don’t have access to proper education, proper facilities. They have to skip meals. I was once one of those kids. I had to skip a meal or so just in order to survive when my parents didn’t have a job. It’s not that things have changed a lot, but we’re definitely in a better place than things were years ago. When I built the school—I used to have to walk 45 minutes to get to school—so we have buses so kids don’t have to walk 45 minutes back and forth to get an education. These are just the basic things. Kids are not able to live like kids. They have to mature fast. They have to figure out a way to survive. They’re forced to mature at an early age; they’re forced to become responsible at an early age because of the circumstances. • OPEN FLOOR: Should the Warriors Chase 74 Wins? RN: What do you find are some of the biggest misconceptions people over here have about the Congo? BB: So, places like the Congo, most of the time they talk about the people they talk about war. there’s always war going on. War is happening in Congo in a very, very small part of the country. Is that something we should be talking about? Yes, people should not be killed over natural resources. At the same time, the thing I find difficult to digest is people saying, “I can’t go to Congo. I’ll get kidnapped. I’ll get this kind of sickness.” I go there every year. I go there every summer. There’s not one time I‘ve come back with one or another disease. I’m still functioning at 150%. That’s one component. But most of it is just the conversation about the negative side. For me, it has become my goal—now for example, we’re refurbishing hospitals. This summer we did three hospitals, and we’re hoping to do more by next summer. The goal is to promote the beauty of Congo, the positive side of Congo. We want investors to come and invest. We want investors to have a clear idea of the human resources. At the end of the day, people are making so much money off the Congo, but the population doesn’t benefit. With my work, the idea that we have is to start building high schools—our second one is going to be done in July or so, and then we start construction on a third—the goal is to build these high schools, and then build three colleges. We can create a blueprint for these kids, who can go from high school to college. And from college, we’re able to partner with companies who would like to invest in them. We’ve also partnered with countries currently in Congo. You have to help this next generation of kids understand about this country. You also have to understand how other countries function so we can apply the same ideas and move ourselves to a better place. RN: Do you feel a lot of pressure to give back? What’s it like for you to be in the position you’re in? BB: At the beginning, a lot of people said, “You’re young, you’re a rookie, you shouldn’t get involved in this.” My only thing is, if I’m not going to do it now, then who is going to be doing it? If I don’t start now, when am I going to learn from my mistakes? It’s not an obligation, it’s a desire, it’s a love. I believe in creating better opportunities and environment for all those kids. When I look at them, I look at myself. If I was that kid, what would I wish to have in my hand? What opportunity would I wish to have? We’ve also started giving scholarships to kids to come to school here. We ask them what they want to do. They want to be doctors, lawyers, and pilots. That takes away all the pressure. Because my focus is shifted all to the kids. All these kids can’t play basketball. How can we give opportunities to them—to girls? How can we promote gender equality? That’s where I shift my focus, and seeing the results, then I’m not thinking about the pressure. I’ve always believed in investing in youth, because the problems we’re facing now, whether it’s Congo, Europe or the U.S., it’s going to be solved by the next generation. God knows what I’ll be doing when I’m done playing, but I want to maximize this opportunity I have to live my dream and help others live their dream in the future. RN: From all the work you’ve been doing, what have been some of the most rewarding moments? BB: The day we went for the opening of my school and the indoor gym, I woke up that morning and I sat outside asking myself, if you would have told me four or five years ago, that one day we’re going to build something that’s going to stay here forever, I’d probably say you’re crazy. But to see it actually come to life, to see the smiles and joy in kids faces, I could never, never explain that feeling. I played five-on-five with the kids in the indoor facility we built. When I used to play in the Congo, we played outside and it used to rain. And when it rained we would run and go hide. When it stopped, we would come back and play. The floor would be slippery, guys would be falling. And the feeling of me standing on top of my court, playing with those kids, and they had brand new shoes, it was so much joy. I was overwhelmed. That was one of the moments that I’m really, really grateful for. Another one was visiting the hospital, the conditions, and as I told them we were working to improving their conditions, the appreciation of those less fortunate people was just overwhelming. They were like, “Even if you don’t do it, the fact that you would even think of us, take time to come talk to us, having the idea of putting us in better conditions, means a lot. You don’t know us, you’ve never met us, we’re probably going to see you two times in our entire lives.” Those were the remarkable moments during my time doing this. RN: I know you had a chance to meet Barack Obama this summer. What’s was that experience like for you? BB: It was great. It was amazing. For me, it was about learning the way he handles other people. The leadership within him. It was amazing. As a kid, I dreamed about a chance to meet Barack Obama. And to meet him was far beyond amazing. His leadership was unique. The ability to control the whole room. The ability to have a conversation with everybody with nobody feeling left out. I think that was cool. But mostly the way he has vision to run things, his thought process. As a kid I was just inspired. I was hoping to learn a lot about his leadership and that’s what I was mostly excited about. And god knows what I’ll be doing when I’m done playing.